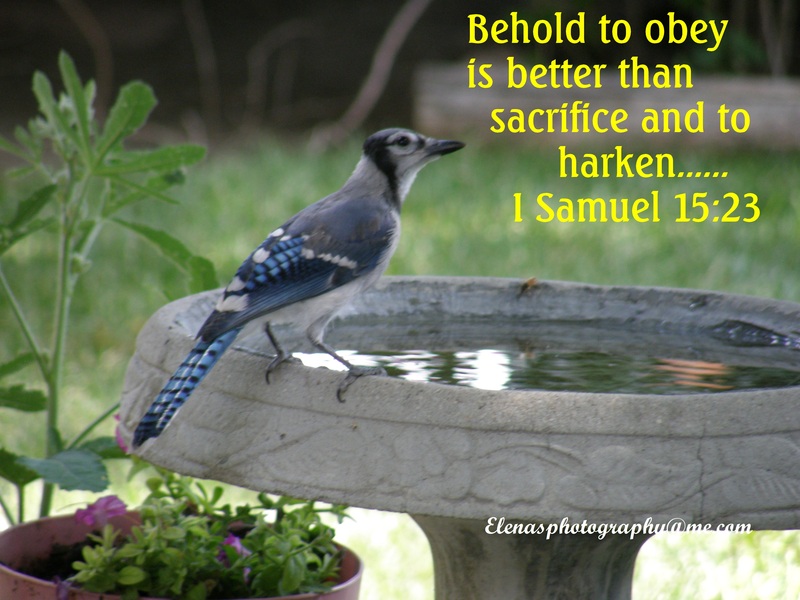 HEARING THE VOICE OF THE LORD AND OBEYING IS BETTER THAN SACRIFICE TO HARKEN…. I want to encourage you, to obey God, when you hear His voice. In small or large matters. Recently, I heard the voice of the Lord, it was morning, and He instructed me to go outside, and water my flowers. Now normally, my morning does not start off that way, I usually have my morning routine, and that includes making our coffee, and then I ease into my chores. Well this morning, I heard the Holy Spirit say, go outside, and water your flowers. I was about to stop and make the coffee, but again, I heard the prompting, go outside and water your flowers. It was that strong, so I even laughed, a little, and said. “Yes sir”, and I went outside, and began watering my flowers. No big deal, I thought, no spectacular thing, but while I was out there, I was praying. I said something to the Lord, that I will keep as private between me and Him, but what I said, to Him, was very unusual. Yet no big deal, till later, when I was on FB here, someone sent me a video, of a pastor speaking. And this pastor said something very unusual, and profound, and said the same thing, in reference, as to what I did. The same words, I said to my Lord, that I said outside. When I heard him say, that, I began crying. For I knew, that I knew, God heard me. I want to encourage you, to “HARKEN” to the voice of the Lord. He speaks to us all in that small still voice. He may be calling you to do something for him. He wants to fine tune that voice, and communication. It may not always make sense, it may be a small thing, but as you do obey, you will strengthen your communication, and relationship with him. He tests us sometimes, to see, if we will be obedient in small things, before He can speak in big things. Now be careful, that the voice, you obey is the Lords, I feel, I have to add. Because the enemy, will try to interject, and speak something as well. To make you fall. But know our Lords voice. His sheep know His voice. It is always, kind, compassionate, and will not cause you to do evil. In any event, I pray, my small testimony, will remind you, to obey. Fine tune, that static, to hear his clear voice. Harken, and obey, and I know you will develop your relationship with our Lord. He speaks to all of us. But to obey, shows you know him. Know His word….so you can know him, even more. This entry was posted in advice, American Idol, ANSWER, Bridge, change, miracle, numb, obey God, PRAYER, Prayer of hope devotional and tagged ANSWER, Christian, christianity, God, HEART, Jesus, photography, religion, response, rest. Bookmark the permalink. ← ARE YOU CONSISTENT IN YOUR LOVE WALK OR CASTING STONES?